You haven’t seen an in depth teaching of a Kickoff Return like this online. Coach Fore goes into tremendous detail to help you understand his highly successful DOUBLE RIGHT Kickoff Return scheme. This Kickoff Return scheme utilizes two double teams at the point of attack to create open space and yards for your returners. Fore shows it to you live in the first video, then walks you through it via “whiteboard” fashion (10 minutes). 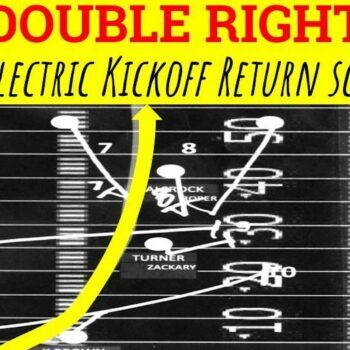 The third video (almost 29 minutes long), and most important one of this series, walks you through two separate real game DOUBLE RIGHT Kickoff Returns so that you become an absolute expert on this return scheme! Your program needs to have a powerful return scheme that they build confidence off of. DOUBLE RIIGHT is it! This was the best return scheme for Victor Valley Junior College in 2017, and you’ll see why on this tape! Coach Fore led the Rams to move from being ranked #20th in Kickoff Return among Southern Californian Junior Colleges all the way to #9 in his first year at the JC level. The Rams finished #1 in their very tough conference for highest Kickoff Return average during conference play at 21.8 yard per return in 2017. Fore uses his expertise as a veteran Special Teams Coordinator to help you understand how to package and put together a powerful Kickoff Return scheme. No stone is unturned during this course!